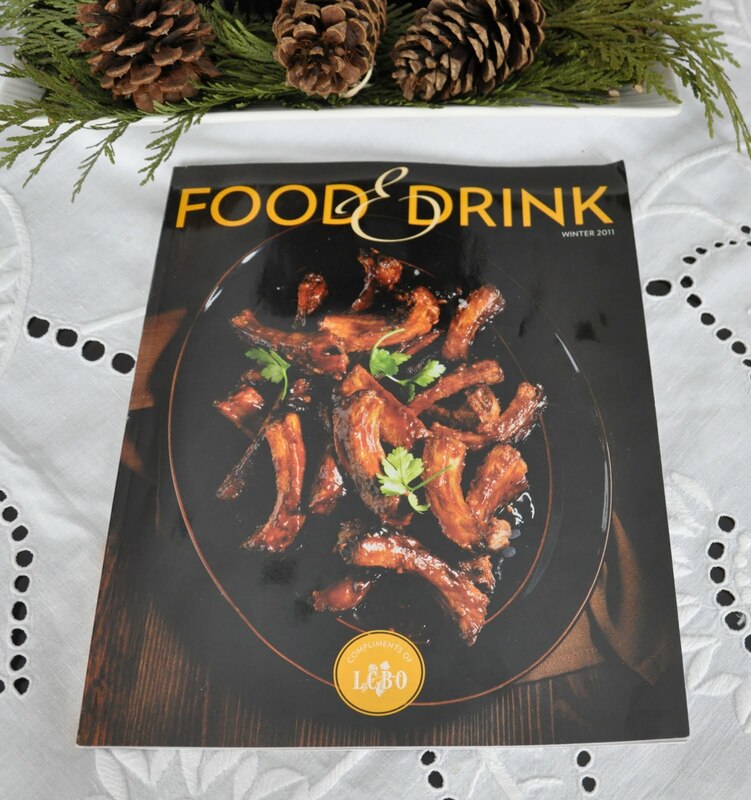 As I sit outside on this brisk, cool day dashing through the pages of the Autumn issue of the latest LCBO Food & Drink magazine, I have to agree with Jody Dunn in her Editor’s Notes, “Comfort food starts to beckon…”. This particular issue is stuffed full of comfort food. But it does hang on, like we are doing, to summer day menus too. After all, the markets are probably at their prime, overflowing with baskets of colourful produce. Lucy Waverman’s Market Menu plays on the idea of making your meal based on what your trip to the market presents. I myself compete ‘black box’ style every other Thursday when my CSA basket arrives. It can be daunting but the outcome is worth it. You are constantly eating what is best of season. Consider the challenge for yourself. Thanks to James Chatto for showcasing 4 power women in the Ontario wine industry in Keepers of The Vine. This summer, we had the opportunity to check out Caroline Granger’s place of work, The Grange of Prince Edward Vineyards & Estate Winery, Prince Edward County. We are definitely fond of her ‘bubbles’. The sparkling rosé was featured at the Cooks & Curds Cheese Gala at the 1st Great Canadian Cheese Festival in Picton in June. Do try those Pumpkin ‘Ravioli’. Using wonton wrappers is a cheat I employ all the time when in a hurry. Many won’t even notice the difference. All the focus will be on ‘homemade’. ** Those beautiful tomatoes featured in the Tomato & Fresh Cheese Salad with Basil & Olive Salsa Verde on page 104 come from Vicki’s Veggies Farm, located in Prince Edward County. I can vouch for their fabulous taste. This summer we grew one of her plants. Yellow Perfection. We are rolling in beautiful, flavour-packed sunny yellow tomatoes. We used some of our early ripeners in an heirloom salad that was a true kaleidoscope of colours. Vicki’s Veggies Farm sells their produce at the farm but also at farmers’ markets in Toronto. The Savoury Bouquet showcases the talents of Michael Pellegrino, florist designer and co-owner of Teatro Verde in Toronto. They are beautiful organic centerpieces that are functional as well as good looking. Flavours & Flair shares the good news that Montreal’s Olive & Olives in now in Riverdale in Toronto. We picked up some of the Manzanilla Olives Stuffed with Lemon on a recent trip to Montreal’s Jean-Talon Market. I always seem to be in love with the playlist. This time Rick Shurman and Earl Torno ‘set the mood’ with The Autumn Playlist. It’s working for me with such numbers as Someday by Harry Connick, Jr., The Way You Look Tonight by Maroon 5 and I’ve Got You Under My Skin – a Rod Stewart rendition. Have to have it? Check it out on iTunes. Plan ahead: The Holiday issue hits the stores 9 weeks from today on Wednesday, November 9th. At present it is 16ºC. Going to a high of 18ºC. UV Index of 3. Cloudy and a 70% chance of showers. Since this past Friday, the days have started their descent into darkness. 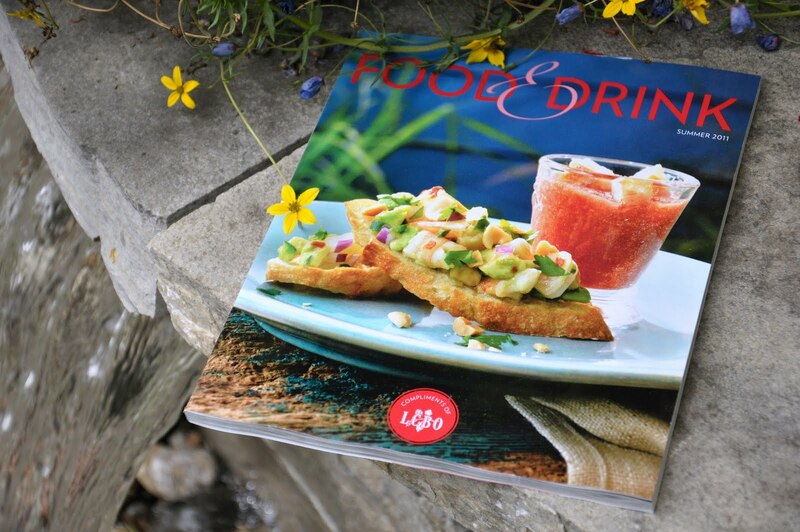 The only thing summer at my house is the LCBO Food & Drink magazine. With the latest issue being released today, I intend to spend my morning warming up in its gloriously colourful pages. This issue is brimming with salads, salads and more salads. As the bounty is already starting to come off the fields (my first CSA pickup with Roots and Shoots Farm starts tomorrow! ), there are so many wonderful combinations that can make the colours and tastes on your dinner table pop. I loved seeing the many strawberry recipes as well. The season is well underway in our zone, but it won’t last long. So if there is something in the Strawberry Social segment calling out to you, make it without delay. I hope you will have good luck finding beautiful, juicy local berries. What caught my attention in this issue? Here are some of the highlights. The Summer Playlist is solid with great tunes meant to make you relaxed and mellow. With the likes of Marvin Gaye, The Temptations, The Supremes, The Four Tops, Smokey Robinson, Fontella Bass and James Brown, I recommend not using glassware for your drinks. You are are high risk of melting blissfully away in your lawn chair. The only one missing seems to be Barry White. Rick Shurman and Earl Torno have done it again. If you have to have it, you can get it on iTunes. Do you have a soft spot for ‘sensible decor touches’? In Inspired Ideas by Brenda Morrison, I was immediately attracted to the colourful Västlig Gardening bags from IKEA. They look very sharp used as vases! 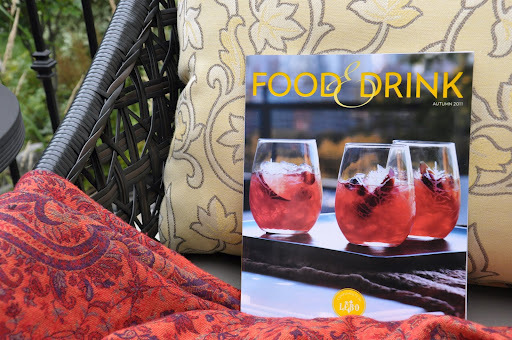 Kudos to Ruth Gangbar for her food styling work! Plan ahead: The Autumn issue hits the stores 10 weeks from today on Wednesday, September 7th. 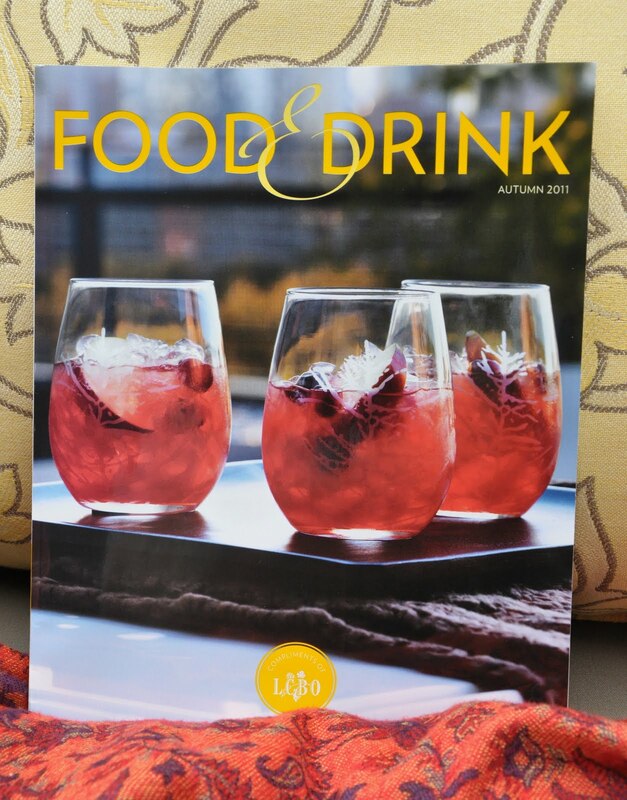 The Winter issue of the LCBO’s Food & Drink Magazine was released today. As always, I made my pilgrimage to be there for the 10 am opening of my local outlet. With all household vehicles occupied already, it meant going by bus! Now that is dedication! As it turns out, it was a beautiful winter’s day for being outdoors and walking around. My test for what is hot in the Food & Drink magazine is to dance through the pages just before Noon and see which ones make my mouth well up. Not a bad test actually. Consider giving it a try. What got me salivating this time? Of course there are so many other delicious recipes full of temptations. I always have a soft spot too for the music playlist. The Sunday Morning Playlist by Rick Shurman and Earl Torno is available for purchase. It features some of my favourite heartache songs like So Far Away by Carole King and Cry Me a River by Diana Krall. The issues are scooped up in no time. You need to get yours fast and find out what is going to get you through the winter blahs.